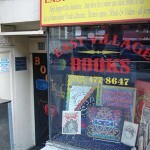 East Village Books NYC – We pay the highest prices for scholarly libraries. We handle estate libraries. We pay the highest prices for scholarly libraries. We handle estate libraries. East Village Books is a used bookstore in Manhattan, New York City. We sell and BUY books, including art and photography books, textbooks (buyback), philosophy, mathematics, religion, occult, esoterica, new age, counter-culture, critical theory, music, literary fiction, Greek and Latin–actually any scholarly subject, review copies, underground comics/graphic novels. Estate libraries are our specialty. We also buy CD’s and DVD’s, except for pop music or mainstream movies. Sell to us first for the highest prices. We buy used books at our store whenever we are open. During store hours call (212) 477-8647. To contact a buyer before we open click here. Cash paid, of course, and you may bring books to our store (we will help you in and direct you to parking if needed). If the quantity is large we will come to you. Thank you for calling us first. Where is the best place in New York City to sell books or textbooks? What is the best way to support your local used bookstore? Donations of books are definitely welcome. We have a fund for non-profits that we replenish from the sale of books that have been donated to us. Find us at 99 Saint Marks Place (subway stops) between Avenue A and First Avenue, Monday thru Friday from 1 P.M. till 11 P.M.*; Saturday from 1 PM till late (at least 11 P.M., sometimes midnite); Sunday from 1 P.M. till 9. *We are now open many days from noon until midnight. Call to make sure if you are coming in before 1pm or after 11pm. You can find the best things in used books. To see an actual copy of a previously unseen document (in French or in translation) written by Henri Cartier Bresson, click on the photo below. This was found in a book by Bresson previously owned by a producer at NBC. 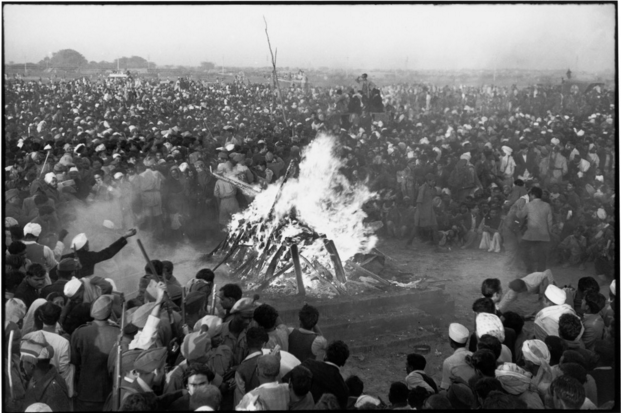 The cremation of GANDHI on the banks of the Sumna River, Delhi, India, 1948. Photo by Henri Cartier Bresson.